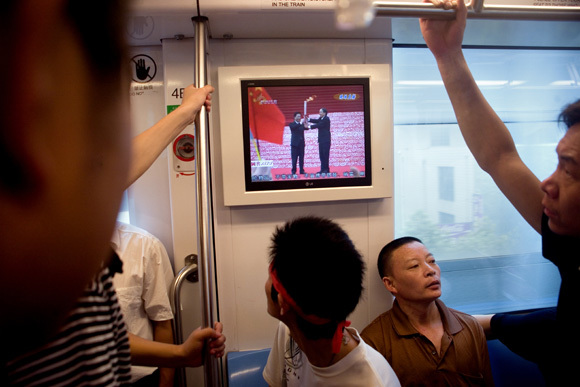 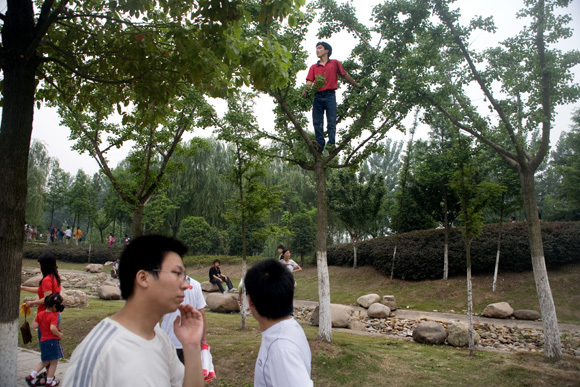 Spectators watch the Olympic torch pass by during the Nanjing, China, leg of the 2008 Olympic Torch Relay. .
Spectators, including one in the trees, watch the Olympic torch pass by during the Nanjing, China, leg of the 2008 Olympic Torch Relay. .
Seen on a screen in a subway train, government officials light the Olympic torch at the beginning of the Nanjing, China, leg of the 2008 Olympic Torch Relay. The train was filled with people going to attend the Olympic Torch Relay as spectators. 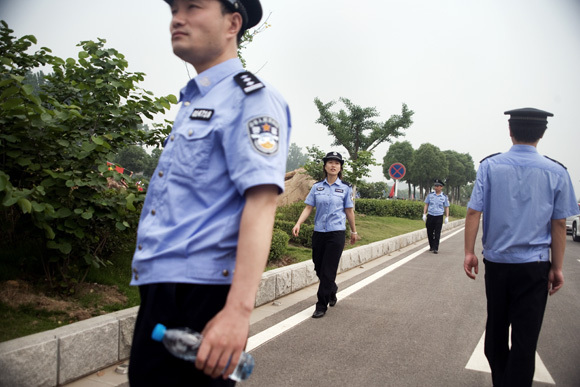 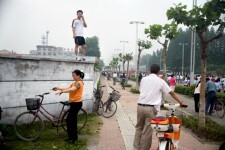 Police keep the road clear and watches the crowd of spectators during the Nanjing, China, leg of the 2008 Olympic Torch Relay. 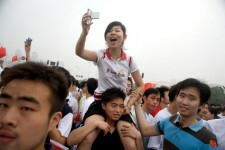 People look through Olympic- and Chinese-themed t-shirts sold by street vendors near the route of the Nanjing, China, leg of the 2008 Olympic Torch Relay. .
A police helicopter flies above the Olympic torch during the Nanjing, China, leg of the 2008 Olympic Torch Relay. 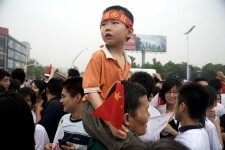 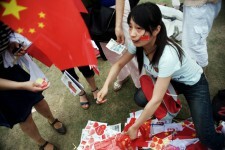 Spectators return home after the completion of the southern portion of the Nanjing, China, leg of the 2008 Olympic Torch Relay. .
A woman sells Chinese flags and other nationalist items to spectators watching the Nanjing, China, leg of the 2008 Olympic Torch Relay. .
Spectators watch the Nanjing, China, leg of the 2008 Olympic Torch Relay. 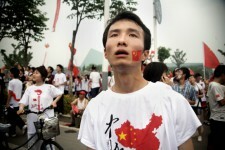 The man's t-shirt depicts the shape of China drawn to look like the Chinese flag. 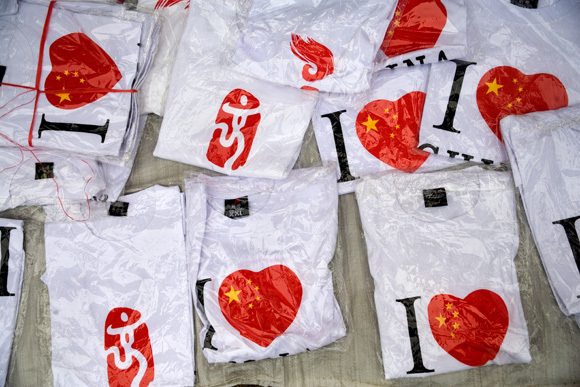 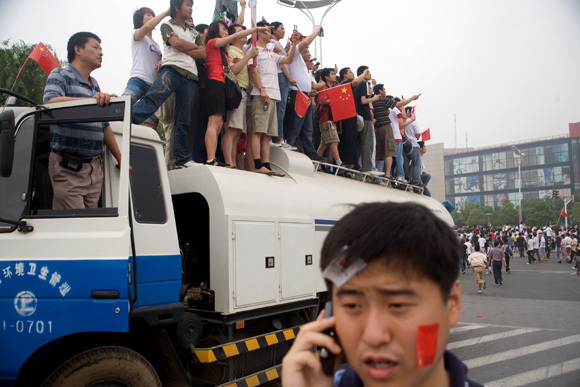 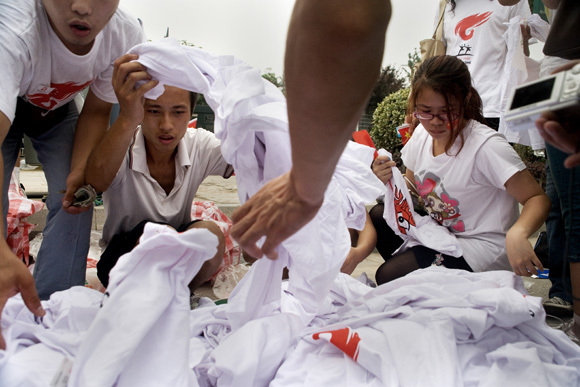 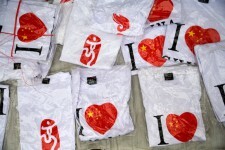 T-shirts bearing the logo "I heart China" or "I love China" and the 2008 Beijing Olympic logo lay in a pile for sale near the route of the Nanjing, China, leg of the 2008 Olympic Torch Relay. .
Spectators stand on a street cleaning truck as they watch the Nanjing, China, leg of the 2008 Olympic Torch Relay. 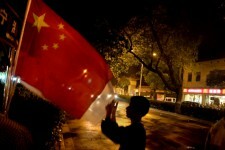 A man looks at Chinese and Olympic flags for sale from a street vendor on a street corner in Nanjing, China, the night before the Olympic Torch Relay arrives in Nanjing. In late spring 2008, the Olympic torch made its way through the outskirts of Nanjing, China, as part of the domestic route of the international torch relay in preparation for the 2008 Beijing Olympic Games. 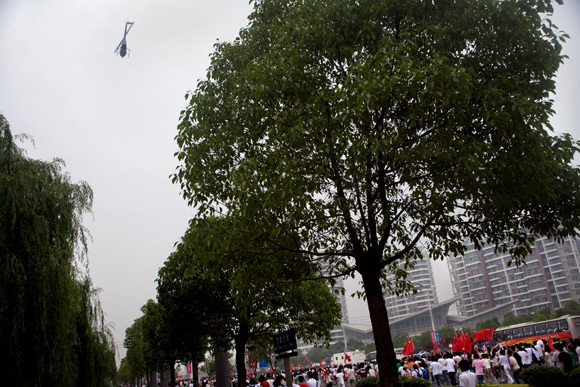 Crowds were estimated to be about 1 million strong, though a great many of them never managed to catch a glimpse of the torch itself. 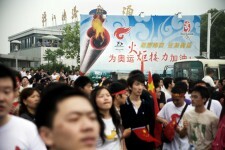 I was about 50 feet away from the torch at one point and, through the pandemonium, couldn’t make out where the torch was.